When it comes to protecting the essential marine habitat of seagrass, scientists have learned that the best thing to do is conserve the seagrass we have, not to reboot meadows from scratch. New York State Seagrass Coordinator Soren Dahl is part of a state initiative developed out of the Seagrass Protection Act of 2012 to try to help local communities make decisions about protecting the seagrass within their jurisdictions, instead of lawmakers in Albany who might never have set foot in a Long Island estuary. 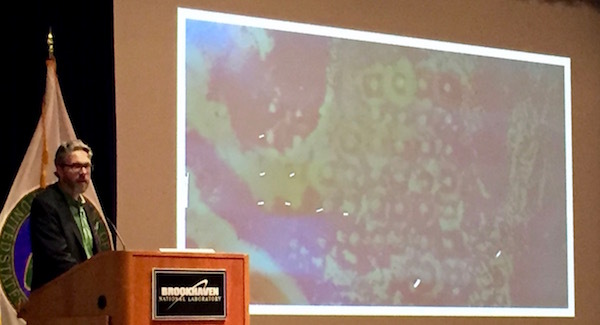 Mr. Dahl gave a presentation on his work at the 2018 Long Island Natural History Conference at Brookhaven National Laboratory. Seagrass isn’t the grass you find along the edge of salt marshes — it’s the grass found deeper in the water, with roots and a vascular system, which provides essential nursery habitat for fish and shellfish. 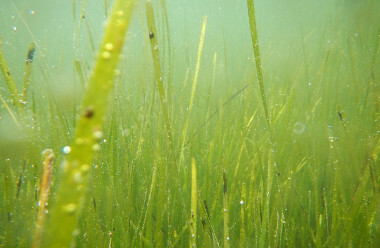 On Long Island, the primary species of seagrass is Zostera marina, known locally as eelgrass, though other areas of the country and the world have a wider variety of grasses. There were 200,000 acres of these underwater meadows in New York in 1930, said Mr. Dahl in his lecture at BNL. That acreage was devastated in the 1930s by a wasting disease caused by a slime mold, and the meadows recovered slowly in the following decades before again being badly damaged by the brown tide in the 1980s. In the year 2000, there were only 2,180 acres left, and ecologists estimate New York is losing seagrass acreage at a rate of 10 percent per year. The DEC has just compiled a statewide map of existing seagrass beds, using data from the Peconic Estuary Program, the Long Island Sound Study and the South Shore Estuary Reserve. The map shows expansive beds in western Shinnecock Bay and in Bellport Bay, both shallow embayments that provide ideal light conditions for eelgrass — when the light iss not obstructed by algae blooms. In the Peconic Estuary, eelgrass beds seem to be hanging on in areas surrounding Shelter Island, on the northeast side of Cedar Point and Orient Beach State Park, in Sebonac Creek, around Fishers and Gardiners islands, and on the west side of Fort Pond Bay. There are three main threats to seagrass beds, said Mr. Dahl: reduced light caused by algae blooms in the water column, which grow due to excess nutrients in the water; increased water temperatures due to climate change; and physical impacts. Existing ecosystems already have a positive feedback loop in place, he said, allowing the below-ground biomass to repair the bed if the threats are lessened. Of the three threats, Mr. Dahl said climate change is the one local marine managers have the least control over. Some areas that once supported healthy eelgrass beds may no longer be ideal habitat due to warmer water temperatures. Mr. Dahl pointed out two successful water quality improvement initiatives, in Tampa Bay, Florida and the Chesapeake Bay, where, over the past few decades, water quality improvement has led to quantitatively significant recovery of seagrass beds. 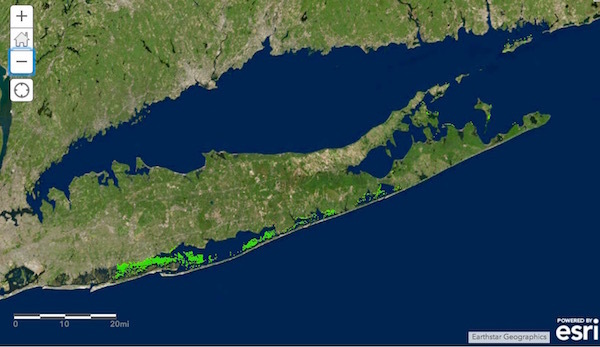 Those areas have a more robust natural ecosystem than Long Island, with several species of seagrass that each fill a different niche within the ecosystem. Those two areas also have the luxury of long-standing bodies of data about the health of the water, something Mr. Dahl said is lacking here. Scientists are just now developing studies of seagrass beds, with Dr. Bradley Peterson’s lab at Stony Brook University developing that data in the Peconic Estuary, and the New York State Seagrass program supporting a similar study in the Great South Bay. While it is well known that bulkheading of shorelines creates a host of coastal erosion problems, the biological problems created by bulkheads get less public attention. Seagrass occupies the shallow waters just off shore, generally in up to eight feet of water, though it can be found deeper if the water is clear enough to provide sunlight that deep. This coastal zone is cut out of the ecosystem when bulkheads are installed. New York scientists are now studying ways to create “living shorelines,” providing both coastal protection and habitat, with experimental projects underway by Cornell Cooperative Extension on the Shinnecock Nation on Shinnecock Bay, and at CCE’s Suffolk County Marine Environmental Learning Center on the Peconic Bay in Southold. Mr. Dahl has been intrigued by work done in mooring areas in Massachusetts, where mooring chains in eelgrass beds have been show through aerial photography to scour the area surrounding the mooring, as the boats turn with the wind. In those areas, marine suppliers have begun selling “conservation moorings,” a mooring system in which a narrow, deep helical anchor is turned into the seabed with specialized hydraulic equipment, with a high-strength polyfiber rope with elasticity in it attached instead of a chain. This rope is equipped with flotation to keep it off the seagrass. “Within two weeks of the mooring replacement, eelgrass seedlings were growing in the scar zone,” said Mr. Dahl. In looking for areas on Long Island that might be suitable for this system, Mr. Dahl took a close look at the mooring field in Coecles Harbor, on Shelter Island, which sits in an eelgrass bed. Using drone photography, he found the same circular scourings seen in Massachusetts around moorings in Coecles Harbor, and he’s now pitched a proposal to implement conservation moorings there to the Shelter Island Town Board. Boating or jetskiing through shallow seagrass can also cause lasting damage to grass beds. Seagrass restoration experts are also looking for volunteers to help collect seeds from established seagrass beds in early June. For more information, contact [email protected].